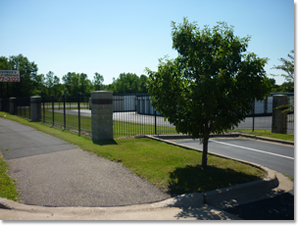 Stephen's Self-Storage has two convenient self storage locations situated within the twin cities; Hastings / Cottage Grove and Oakdale. Whether you are moving to Minnesota or live here already, we are a leading choice for all your self storage needs if you need storage near Hastings or near Oakdale. You will find that we are different from all the national and local chains because we are a small locally owned company where the owner deals face to face with customers right at the store. We are committed to providing clean and secure mini storage facilities, U-Haul truck & trailer rentals, low rates, and excellent customer service - that's our mission. You'll see we work hard to meet all your self storage needs and look forward to serving you! We offer storage units in various sizes from 5'x5' to 10'x'30. You have access to your storage unit seven days a week. Call Stephen's Self-Storage in Oakdale or Hastings today! Hastings: Serves Hastings, Cottage Grove, Prescott WI, St. Paul Park, Woodbury, Newport and MORE!! Drive up access, Access 7 days a week, Electronic security gate. We occasionally go to the Hastings / Cottage Grove facility during this time on an as-needed basis. So the times in which we are at the facility may actually vary depending on where we are needed. It is therefore recommended that you call ahead to set up an appointment. Important: Call for availablity and to schedule a time to view units. We occassionally go to the Oakdale facility during this time on an as-needed basis. The times in which we are at the facility may actually vary depending on where we are needed. It is therefore recommended that you call ahead to set up an appountment. IMPORTANT: After making a reservation we will call you or you must contact us to schedule an appointment to complete the rental process. Your reservation will guarantee the space for up to 7 days from the date the unit becomes avaialable. Reservation deposits are 1/4 of rent (minimum $25) and are refundable only if we are unable to fufill your reservation request. Deposit is applied to first month's rent. Limited Availability means that the space may not be immediately available however, space availabilty can change very quickly or spaces may be available at specific dates in the future. Please call us to check if the space will be available by your required move-in date. Discounts: There are additional discounts available for prepayments of 6 and 12 month terms and discounts for military, police, fire and EMT's. Please contact us for more details about these offers. 1A 5% discount (rent rounded to the next dollar) is offered to customers who sign up for automatic billing using ACH. Cancelling ACH billing will result in the loss of the discount. Discount applies only to existing customers paying the current standard rates published above. This discount may be combined with our military/police/emt & prepayment discount offerings ONLY. Please call us if you have any other questions regarding this discount. 2Special OFFER, rent rounded up to next dollar. Automatic billing required for full discount. Must stay at least 3-months. If move out occurs before the minimum stay requirement, total discounts received (other than the ACH portion of any discounts) become due. Available units only, Must reserve before 5/4/2019, move-in within 7-days of available on date, and select ACH/eCheck billing at time of signing the rental agreement to receive the rate shown. If ACH/eCheck is not selected an additional charge equal to 5% of the standard rate will be added to the discounted rate during the promotional period. Offer not valid on third-party reservations. New customers only, not valid for existing customers or for additional units. Additional move in charges may apply. 3This is a competitor online only rate matching special. We like to, and would prefer that all companies be completely honest with our customers but some of our competitors offer ultra-low seasonal or 'teaser' rates that will only apply during off-peak times. We are not a fan of this way of pricing however, in order for our prices to be competitive during these times we have little choice but to do the same thing, at least during off-peak rental times. This rate is guaranteed for a minimum of 2-months past the time any other move in discounts end and is thereafter subject to change in accordance with similar formula to those that we are matching. 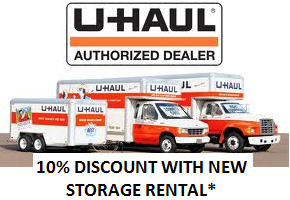 This rate is offered only on specified storage units subject to unit availability. This offer is valid for new customers only and not available on transfers or additional spaces . Agreement and pricing terms and conditions can and will adjust as specified above and with proper notice. Free lock, truck discount offer and military, police/fire/emt discounts are not available in addition to this special. Reservation MUST be made ONLINE through this site (no third party online, phone, or walk-in reservations) to receive online price. If ACH billing is not selected an additional charge equal to 5% of the standard rate will be added to the promotional price. Please contact our office for more information about this offer and we will fully explain the pricing changes you can anticipate to receive over time as well as other special offers that may better suit your needs. Prices are good for reservations made directly through us. Reservations made through other third-party entities or websites are subject to the rates and specials published on that site or quoted by the third party. Thank you for your understanding! Oakdale serves the communities of Oakdale, North St. Paul, Maplewood, White Bear Lake, Lake Elmo, Stillwater, Mahtomedi, Woodbury and MORE! Hastings serves the communities of Hastings, Cottage Grove, Prescott (WI), St. Paul Park, Woodbury and MORE! The FEEDBACK FORM is not intended to be used to make changes to your account for items that require a signature such as a CHANGE OF ADDRESS or a VACATE NOTICE. These items require a SIGNATURE for your security! If your request requires a signature you will need to submit your request in person, using our door drop-box, by postal mail or by scanning the request in as an e-mail attachment. Feedback form messages and e-mail that contains instructions that require a signature will not be accepted. If you need a specific form to make account changes, these forms can be requested here. Thank you for your understanding!